In stock -This product will ship today if ordered within the next 2 hours and 4 minutes. Rich Indian Sandalwood is at the heart of this moody, warm, velvety and woody blend, tempered by slightly sweet top notes of Tangerine, Sweet Orange and Mandarin - providing a beautiful lift. This is a deep and nuanced Sandalwood like no other. Fun, fresh and fantastic, Pacifica Spray Perfume is made with natural, pure grain alcohol (corn-sourced and gluten-free) and Pacifica`s signature perfume blends with essential and natural oils! Alcohol denat. 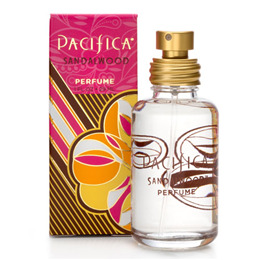 (natural grain), parfum (Pacifica`s own fragrance blend with natural and essential oils), aqua (water). Below are reviews of Pacifica Spray Perfume Sandalwood - 29ml by bodykind customers. If you have tried this product we'd love to hear what you think so please leave a review. Product arrived very quickly. I have used this perfume before and love it's aroma. I found using the spray creates a more lingering effect as my clothing is scented. Would love to try other perfumes in this range. Some samples would be great.